Masterton olive oil makers, Loopline Olives, is turning a habit of winning top awards into a tradition. The company, run by Kate and Mark Bunny took out the Best in Show and Reserve Best in Show at this year’s New Zealand Extra Virgin Olive Awards on Saturday night in Masterton. This is the third time the Bunnys have won the Supreme Award, having taken out the top award last year, and in 2014. Wairarapa producers took out the top five awards of the evening and of 109 medals up for grabs, the region’s growers grabbed 46. Juno Olives, of Greytown, won a handful including the Best in Boutique Category for growers who produce less than 250 litres of certified extra virgin olive oil, as well as Best in Class in the Boutique Intense Single Varietal Class with its Juno Picual. Juno also won Reserve Best Boutique with their Juno Koroneiki. Fellow Greytown producer, The Olive Press, took out the Best-Flavoured Oil Award with their Pressed Gold Lime Infused for the second straight year. The Olive Press was also the Best Processor. The judges handed Martinborough’s Olive Black Trading Ltd the Best Label award. 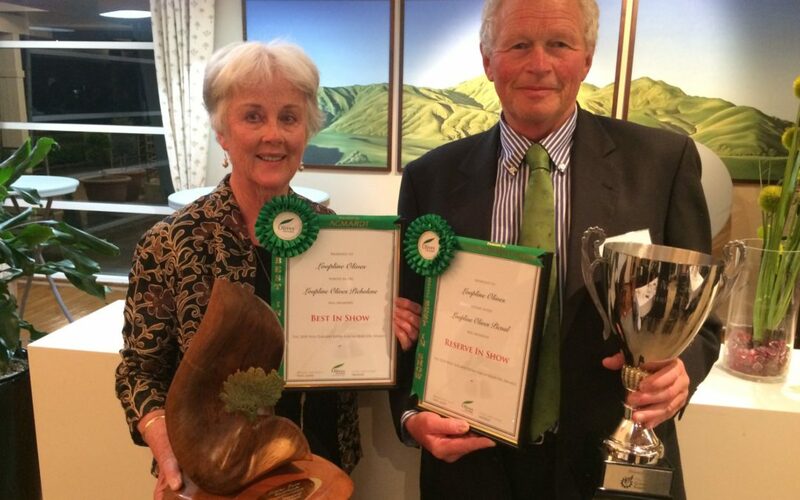 Other Wairarapa olive oil producers — Dali, Left Field, Olivo and Blue Earth – were Best in Class winners this year. It was the Bunnys’ Loopline Picholene competing in the commercial medium single varietal class which took this year’s overall trophy — and the couple’s personal favourite, Loopline Picual, competing in the commercial intense single varietal class, won Reserve Best in Show. “We do love our picual, it is easy to sell and yields well,” Kate Bunny said. This year was the first time they filtered their olive oil as they were conscious about “cloudiness” — and it paid off, she said. “What makes the best oil is a lot to do with nature … you don’t have control of soil types and sunshine hours, they are there just because,” Mark Bunny added. The latest growing season had been great — summer had got “a little bit dry at one stage”, but that added stress on the olives had brought out the unique flavours. The couple, who were previously sheep and beef farmers, took over the Opaki groves about a decade ago. The medium-sized grove has about 900 trees that were established in 2001. Olives NZ Wairarapa chairman Andrew Priddle, also of Wairarapa Olive Harvesting, said the dedication of the region’s growers was behind their dominance at the annual awards. “It has to be a combination of everything including the location and soils … but there are very good oils produced in the rest of the country,” he said. Head judge Esteban Santipolio, of Argentina, said the extra virgin olive oils entered into the awards were some of the best he had tasted this season.